Of the many adventures that I had at Open Engagement, I enjoyed an evening at the Portland Art Museum. Their annual program, “Shine A Light,” came together in conjunction with PSU’s Social Practice MFA, in an effort to “ask visitors to reconsider what is possible in a museum.” It featured a number of MFA artist’s works including a reenactment of a lost Grateful Dead concert (“Turn on Your Lovelight” by Travis Neel), a dental trailer offering free dental work to visitors (“Dentistry at the Museum” by Zachary Gough), a booth in the basement where viewers were encouraged to record stories of objectified objects and being objectified (“ObjectificationÂ Stories” by EricaÂ ThomasÂ and Heather Donahue), an invitation to commune with dead artists via mediums from Portland’s own Psychic Siamese Terror through select works of art (“The Dead Artists Salon” by Alysha Shaw) and much much more. (full program here) At every turn through the museum that night, you could feel the institutional context in a concentrated experiment in flexibility. It felt like a kind of earnest game, one in which visitors were simultaneously challenged to revise and open up their own expectations. It was a glorious mayhem. Outside, between the museum’s two buildings, people of all ages danced expressively. A beer truck stood across from an artisanal pizza tent, as the torches to PAM’s second entrance (what was a Masonic temple in a former life) bloomed brightly in the coming dusk.Â Artisanal popcorn was also for sale.Â In the midst of this, I ran intoÂ Dillon de Give, another Social Practice MFA presenting work. His project,Â 4-6 Dogs in the MuseumÂ furthers the desire to flex the museum structure, except in de Give’s case, he tried to apply that flexibility to non-humans. Owners Steve and Tannis with dog Buddy at “Thunderbird” by Mark Sponenburgh, 1945/1950. Image taken on March 13, 2013. Caroline Picard: Can you talk about where 4-6 Dogs Allowed in the Museum originated as an idea for you? Dillon de Give:Â The project originated as an off-handed comment I made in a brainstorming session. I wrote down something like, â€œallow dogs into the museum, have some sort of plan for when they poopâ€. I didnâ€™t think about it very much at the time, but then for some reason it kept coming back into my head. Iâ€™ve been interested in the power relations present in our dealings with animals for a while. Dogs are the most common â€œother halfâ€œ of a public human-animal relationship â€” especially in the city. They are the animals that people walk side-by-side with, and many see dogs as family members. At the same time they are a point of mystery, like art. That relationship was the subject of the work, but the process of examining the subject by partnering with an art institution was also important to developing the idea. I entered into these dealings being identified as a student, as much as an artist. And as such, the strength of my position as a negotiator was recognized, but somewhat limited. The initial proposal was to open the doors of the museum carte blanche to dogs during Shine A Light, the one night event that â€œasks visitors to reconsider what is possible in a museum.â€ An official mechanism by which to allow dogs into the museum was attractive to me, because it involved a conversation around breaking a taboo. Admitting a new kind of life into the institution, proved to be fairly complicated. Have you ever tried to bring an apple into another country? It can get you into a lot of trouble. Yet I knew it was not out of the realm of possibility, because the museum was legally bound to admit service dogs. The initial proposal also stated that any difficulties, negotiations, and ad hoc measures of control necessary to execute the idea (which at that time called Dogs Allowed in the Museum) would be considered part of the work. I didnâ€™t know how much resistance the idea would actually meet with (a lot) but including this provision allowed it to move forward. The project changed many times, and almost died. At one point we were discussing a version called A Dog Allowed in the Museum. I had to let go of the initial proposal for universal dog entry. But it was important to me that the dogs that participated be â€œnon-workingâ€ dogs, and we held onto that. 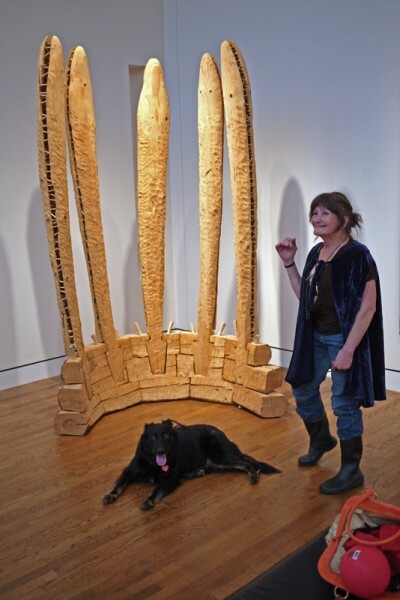 Owner Sharron with dog Sydney at “Surround” by Lee C. Imonen, 1996. Image taken on March 13, 2013. CP: I feel like this piece attempts to open up the field of social practice outside the human sphere of experience. That effort could have interesting ramifications, for instance, what does inter-species social practice look like? Are you interested in that question? Do you have ideas about what it could lead to? 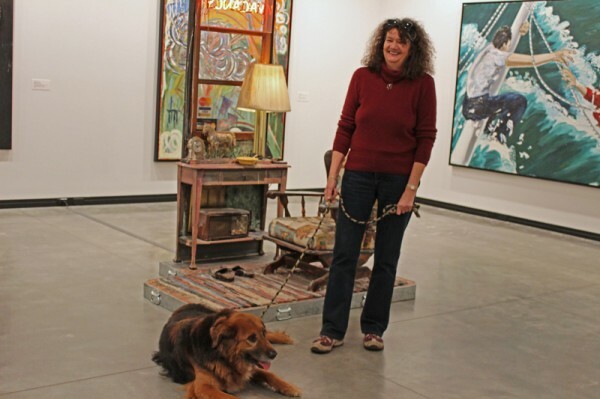 Owner Lis with dog Milo at “Useful Art #5: The Western Motel” by Nancy Reddin Kienholz; Edward Kienholz, 1992. Image taken on March 13, 2013. DDG:Â Interestingly, during the initial stages of the project it was as hard to convince dog owners on the merit of allowing dogs into the museum, as it was to convince the museum itself. Most dogs are really not interested in spending time in a foreign indoor environment. When I determined that the goal would be to have the owner choose a particular artwork as a hypothesis about what the dog would appreciate, then the conversation became easier. I had a simple, but precise interaction that I would use to engage people. The actual dog park was not the most productive place to approach owners. 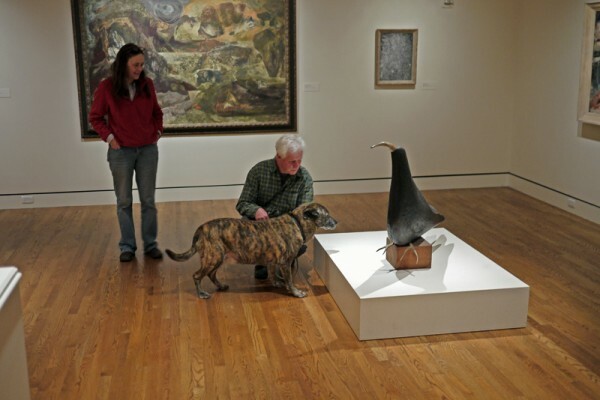 Sometimes people would be weirded out and walk away, but the people who decided to participate saw value in the idea of having their animal enter into a context of art-meaning. Owners Bill and Rebecca with dog Ginny at “Neahkanie Mountain from Manzanita Beach” by Alfred Herman Schroff, 1919. Image taken on May 8, 2013. DDG:Â Each dog was given a â€œpersonalâ€ moment with the work, and we would all watch the dog to see what they would do. I donâ€™t think they saw anything special. Maybe they did, but we have no way of knowing. They acknowledged the art objects spatially. They looked at them. They sniffed them. I think the owners that participated knew their dogs well, and in most cases took into consideration their particular dogâ€™s point-of-view in the choice of artwork. Most objects were near the ground, often three dimensional, and often made of natural materials. One was a sculptural representation of another animal. There was one low-hanging painting that was chosen because it depicted a beach that the owners and dog visited on vacation. One of the owners, Lis, chose Useful Art #5: The Western Motel by Nancy and Edward Kienholz, which basically recreates a kind of domestic environment. I do think that the dogs had a sense of accomplishment in navigating a new environment without too many incidents. DDG:Â It was a very controlled experience. Members of security, collections, and education needed to be present. 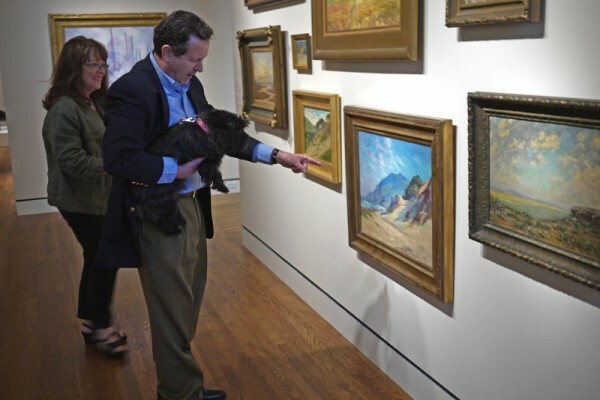 It was stipulated that the visits happen after museum hours, in brief 20-minute segments, one dog at a time. A dog trainer also accompanied the group to provide a level of assurance. The first visit was quite tense, by the final visit, it was more relaxed because we knew what all of our roles were and had a better sense of the choreography involved. 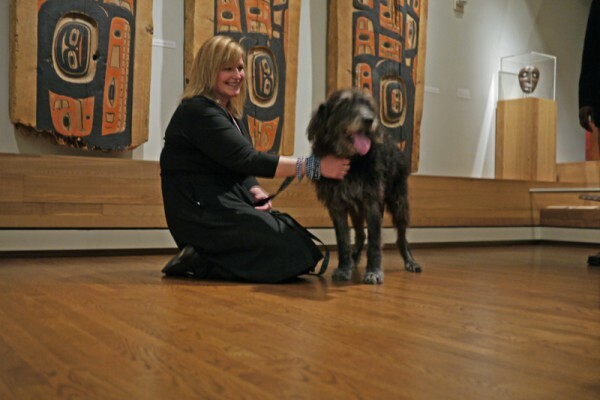 Owner Amanda with dog Tyrone at “House Panels” by Unknown Tlingit artist, late 19th century. Image taken on March 13, 2013.